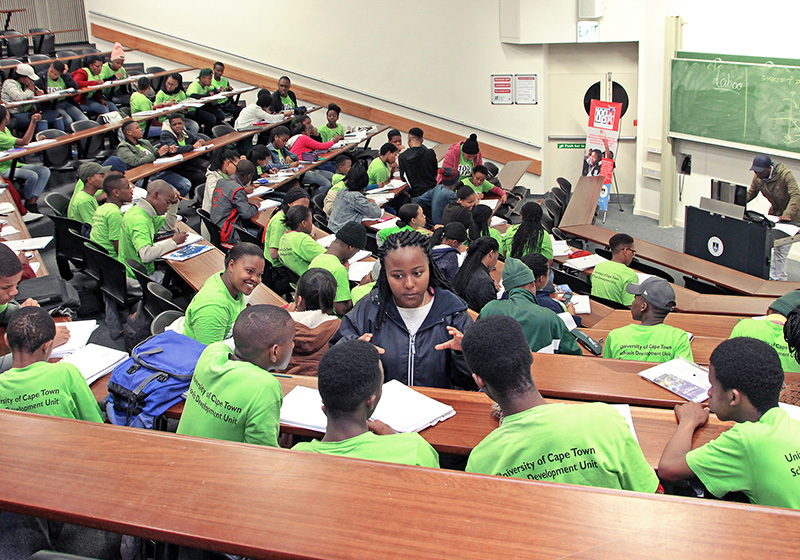 The recent intake of learners to the 100UP programme – which assists them through matriculation and the university application process, and ultimately to graduation – heralds the start of an enduring relationship between these promising young people and the University of Cape Town (UCT). The 100UP programme, the flagship project of UCTʼs Schools Improvement Initiative (SII), aims to address the dearth of learners from disadvantaged backgrounds entering the institution, with a special focus on those from the Western Capeʼs township schools. The intervention coaches them towards access to UCT and other universities. The programme began as a pilot project in Khayelitsha in 2011, with five grade 10 learners identified from each of the township’s 20 high schools. Today the 100UP mentors work with 300 learners from grades 10 to matric, and has been extended to Mitchells Plain. Aside from academic tutoring and mentoring, the programme includes life skills training with the aim of taking the learners “up in life and out of the township”, according to project manager Ferial Parker. “We realised in the second year [of the project] that on the border of Khayelitsha are Mitchells Plain schools; there are 16 of them. “In grade 12, after the June exam, we select [more promising] learners who have a chance to get in at UCT and other institutions. With them on board, the numbers have increased every year. “Of the first group, 31 have already graduated … and there are six students doing postgraduate studies. It’s amazing,” she said. The 100UP programme introduces the learners to UCT in grade 10, as well as other universities and tertiary institutions. “We get all the faculties to do workshops with the learners, and we have student organisations, like the Commerce Student Council, do a workshop with them. Just to ignite that little flame and to inspire them,” Parker explained. “Then when they get to grade 11 we focus on the academic subjects. So they will have Saturday classes in Khayelitsha in a school hall. We have teacher-tutors to [revise] what they’ve learned during the week and just enhance it. The grade 11s also have a three-day camp here at UCT. All of them love it; they love staying over at UCT. 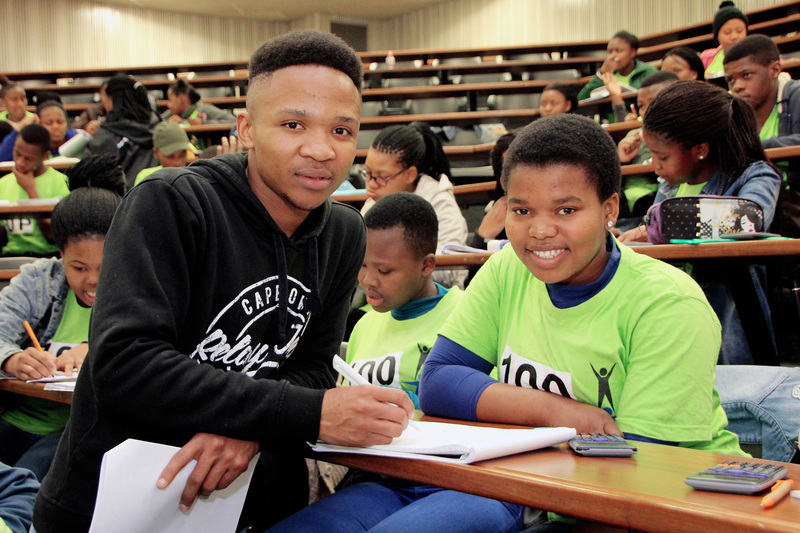 Matric 100UP learners receive tuition in mathematics from 100UP Plus students. The programme offers a valuable advisory service to learners. “We monitor their results to be very realistic. We constantly tell them what the requirements of each faculty are, how far they are from the requirements and how much they must pull up their socks. It’s basically mothering, so that they have someone who’s got the answers to their questions and can give them realistic advice,” Parker said. 100UP does not end with university admission, however. Once enrolled, they become 100UP Plus students and can both access support from the programme as well as mentor the new cohorts of 100UP learners. For the grade 10 learners who have just joined, “this is the beginning of a very long road”, said Parker. A bonus for the learners is that their tutors have come through the 100UP programme themselves. Another participant, Thamsanqa Gaika, said it helped that they and their tutors came from similar backgrounds, and so could relate to the challenges they face. “Unlike teachers, they [the 100UP Plus mentors] are closer to our age group. It’s easier to talk to them and because there are four of them they cover much more work than one teacher,” participant Ntsikayomzi Cwayi added. 100UP has been influential in the learners’ future life choices too. Phumlani Xhamfu has applied to study accounting at UCT. Story Sarah Middleton. Photos Axel Unger.